28 Sept 2012: The work on enclosing the extension is the main task, but other work has to be done too. This is the start of work on the triple louvre solar shader. This will be over the main south window. The window is a thermal window, meaning that it can gain more heat than it loses. Clearly, this isnt completely desirable in the height of Summer, so a solar shader is a good device to fit. 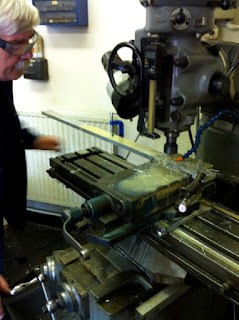 Dave Oliver (of our department), a metals engineer, is routing out an 80mm long slotted hole in the cantilevering arm. This is part of a friction hinge design for a 'Yielding cantilever' whereby if someone reaches up and tries to hang from it, the shader will yield gracefully, lowering… and can be pushed back into place. Dave has a digital router, that can work metal to accuracy of thousandths of a millimetre - slightly more than I need for this, but a lot better than I could do in my garage with the angle grinder. 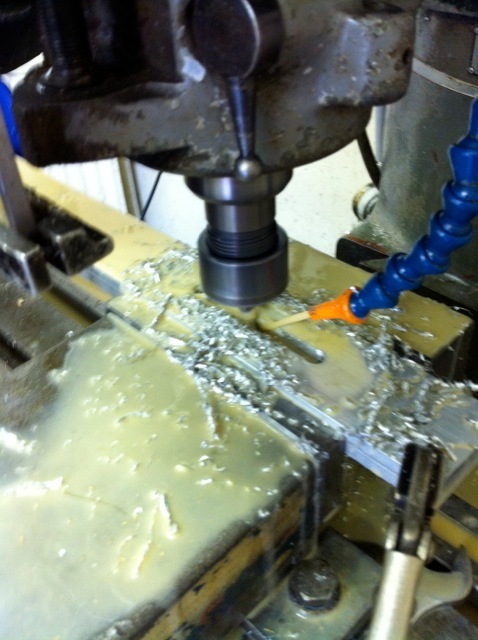 Close up, the cutting head is subjected to a continuous flow of water to cool the cutting head and to assist in the cutting action.